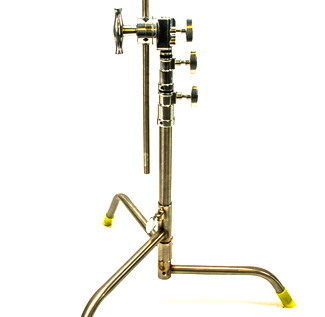 C-Stand also known as a Century Stand or a Grip Stand. 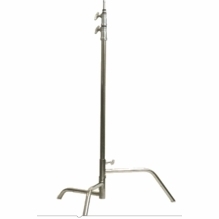 C-Stands are made of steel and are available in 20", 40" and 60". 40" is the "standard" size stand. Steel is the preferred material as these stands have a compact footprint and are used to arm out (offset) nets, flags, silks, lights, cards and props. 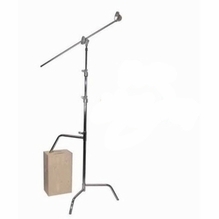 Sandbags or shotbags are usually required to counterbalance the offset weight. 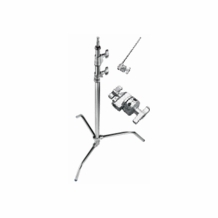 C-Stands are available with fixed, removable or sliding leg bases. Fixed base are fast to setup. Removable base allows for compact and easy travel. 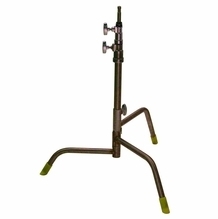 Sliding legs allow for use on uneven surfaces while working outside or leveling on stairs. Each leg is set at a different height for easy stacking. In addition, the varying heights allow for getting the legs under or over objects. Found on almost every film, tv or photo set as they are a tool that solves many problems. 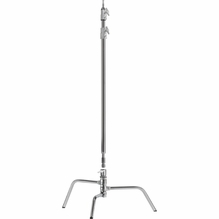 Most models are available in either chrome or black finish.